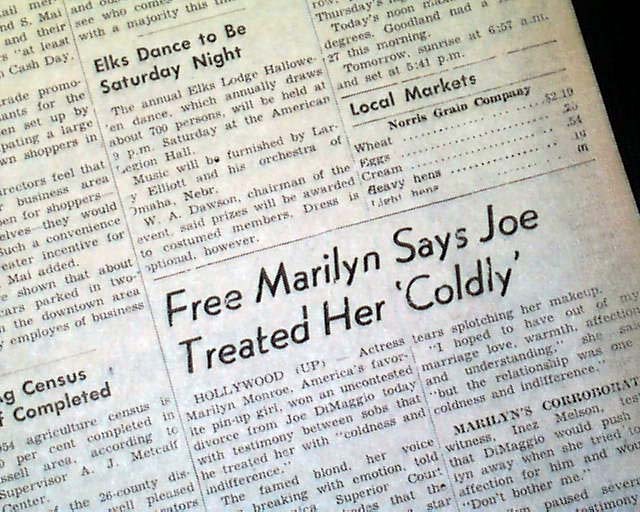 This 8 page newspaper has a two column headline near the bottom of the front page: "Free Marilyn Says Joe Treated Her 'Coldly'" which tells of the divorce between Marilyn Monroe and Joe DiMaggio. See photos for complete text. Other news and advertisements of the day throughout. A few small binding holes along the spine, otherwise in good condition. wikipedia notes: In 1951, Joe DiMaggio saw a picture of Monroe with Chicago White Sox players Joe Dobson and Gus Zernial, but did not ask the man who arranged the stunt to set up a date until 1952. Monroe wrote in My Story that she did not want to meet him, fearing a stereotypical jock. They eloped on January 14, 1954. During their honeymoon in Japan, she was asked to visit Korea as part of the USO. She performed ten shows in four days for over 100,000 servicemen. dr malim zeeshaan Maury Allen quoted New York Yankees PR man Arthur Richman that Joe told him that the marriage went wrong from then. On September 14, 1954, Monroe filmed the skirt-blowing scene for The Seven Year Itch in front of New York's Trans-Lux Theater. 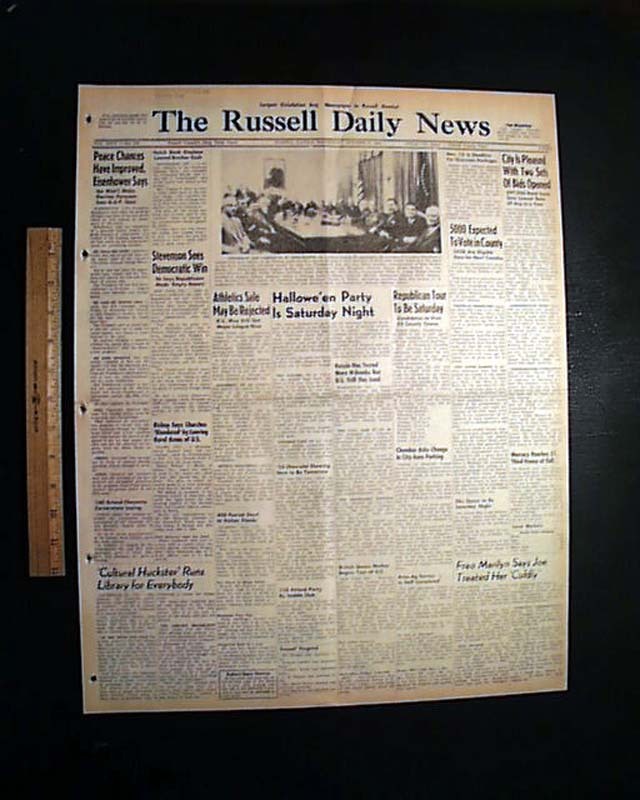 Bill Kobrin, then Fox's east coast correspondent, told the Palm Springs Desert Sun in 1956 that it was Billy Wilder's idea to turn the shoot into a media circus, and that the couple had a "yelling battle" in the theater lobby. She filed for divorce on grounds of mental cruelty 274 days after the wedding. In February 1961, Monroe was admitted to the Payne Whitney Psychiatric Clinic. She contacted DiMaggio, who secured her release. She later joined him in Florida, where he was serving as a batting coach at the New York Yankees' training camp. Bob Hope jokingly dedicated Best Song nominee The Second Time Around to them at the 1961 Academy Awards. 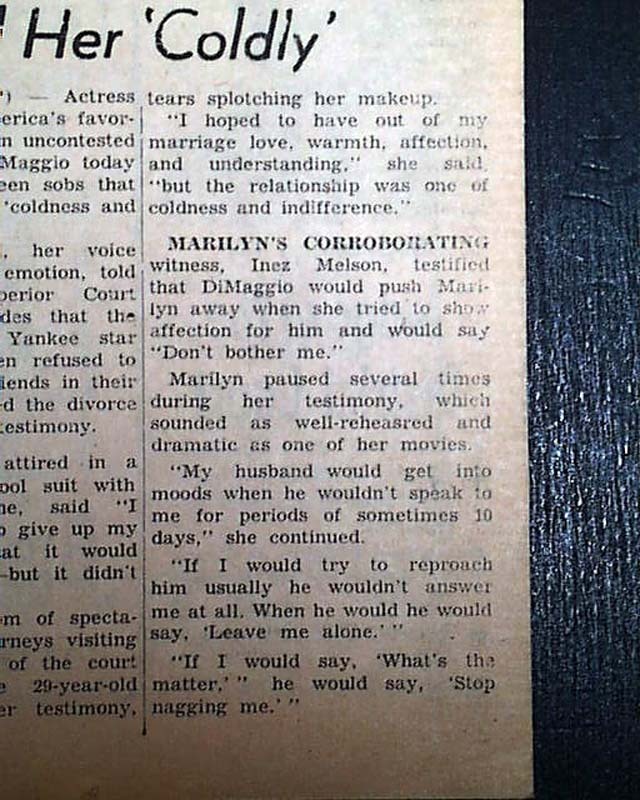 According to Allen, on August 1, 1962, DiMaggio – alarmed by how Monroe had fallen in with people he considered detrimental to her well-being – quit his job with a PX supplier to ask her to remarry him. After Monroe's death, DiMaggio claimed her body and arranged her funeral. For 20 years, he had a half-dozen red roses delivered to her crypt three times a week. 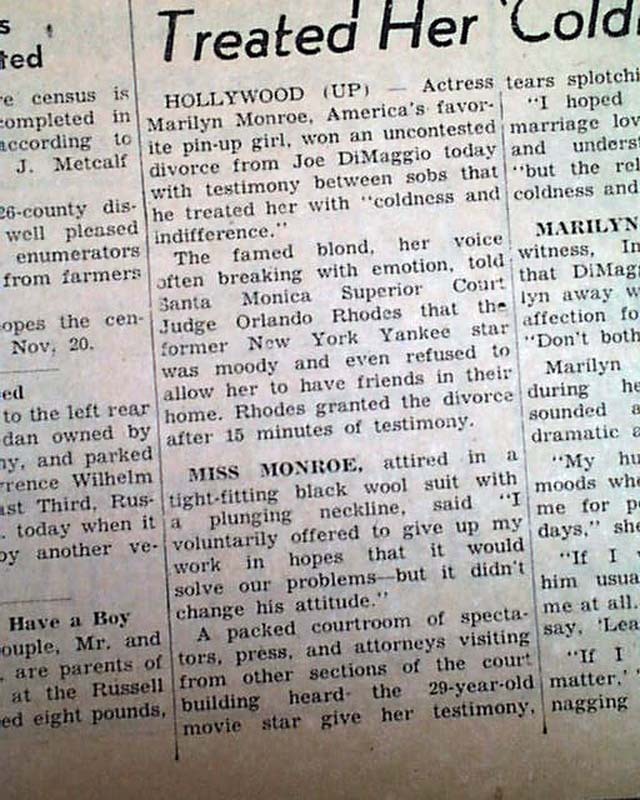 In 2006, DiMaggio's adopted granddaughters auctioned the bulk of his estate, which featured two letters Monroe penned to him and a photograph signed "I love you, Joe, Marilyn."